Next year will mark the centenary of the Balfour Declaration and the 50th anniversary of Israel’s occupation of the West Bank. Britain has a historic responsibility to challenge the Israeli government’s conduct in the West Bank and Gaza. Next year will mark the centenary of the Balfour Declaration as well as the 50th anniversary of Israel’s occupation of the West Bank. With no sign of an active peace process between the parties, here in Britain we have a historic responsibility to seriously challenge the Israeli government’s conduct in the West Bank and Gaza. On a recent visit to the West Bank, I saw powerfully for myself the need for better legal protection for young Palestinians. Without this I fear that we will engender an entire lost generation of forgotten Palestinian children. Yair Golan, the deputy head of the Israeli military, caused an uproar in April when he called for “national soul-searching” and warned that “there is nothing easier than to behave like an animal and to act sanctimoniously”. Earlier this year I understood better what he meant when I found myself sitting in disbelief whilst watching proceedings unfold in Ofer Israeli military court in the occupied West Bank. Israel is a democracy that claims to practice the rule of law. But here were Palestinian children, shuffling into court with their hands tied and their feet manacled. Waiting to go into the court room, we spoke to families who often haven’t seen their children for weeks and only then after struggling on lengthy journeys through numerous checkpoints. They told us – a cross-Party group of UK Parliamentarians – their personal experiences in a defeated, world-weary way. The courtroom itself was small, crowded and chaotic. A cast of actors jostled and moved around; prosecutors, defence counsels, ushers, warders, clerks, together with unidentifiable others who float in and out. Conspicuous by their absence were witnesses or indeed any process by which evidence is tested in court. Things became clearer when we learnt that after interrogation – sometimes when sleep-deprived and often without the presence of a lawyer – virtually every defendant pleads guilty in order to secure a shorter period in custody. The proceedings were presided over by a uniformed military judge whose main preoccupation seems to be ensuring that the prisoners in the dock are those on his flow of dockets. A series of brief exchanges followed between the judge and the prosecution, another soldier, and the defence, a civilian lawyer who has not met the defendants before. The judge then announces his decision, but not necessarily facing the defendants. If a family is willing to pay a fine – often substantial – the prisoner may be released, but only after payment. A father rushes out of court after securing the paperwork to try to pay in time for his son’s release for a family wedding. We subsequently learn that according to the military court’s annual report for 2011, $3.4 million a year in fines is raised, so Palestinians seem to be funding their own misery. Palestinian children grow up in a culture of fear, intimidation, suspicion and sometimes death. Of course, viewed from the Israeli government’s perspective, this military system has been very effective in controlling the 2.7 million Palestinians who live in the West Bank while protecting over 400,000 Israelis who have settled there illegally since 1967 (this figure does not include 200,000 settlers in East Jerusalem). There are now over 125 of these settlements, in reality towns, sanctioned by the Israeli government and over 100 so-called “outposts” which in turn will grow. According to the Israeli Central Bureau of Statistics, this Israeli settler population is expanding at over three times the rate of the Israeli population as a whole. Each day in Palestine brings new demolitions of Palestinian structures sometimes those funded by international aid. Since the beginning of 2016 alone, nearly 600 structures have been demolished and over 800 Palestinians displaced, half of whom were children. There are now over 11,000 approved demolition orders for these structures awaiting execution, usually with little notice and sometimes in the middle of the night. The state of unrest in the West Bank remains troubling, with increasing deaths and serious injuries of both Palestinians and Israelis, although the numbers for the former are much larger than those of the latter. Palestinian children now grow up in a culture of fear, intimidation, suspicion and sometimes death. We saw this in sharp relief when we visited a house in Duma firebombed by settlers, killing the parents and their baby. For this generation of Palestinian children there is no horizon of hope that the misery will end. A divided and elderly Palestinian political cadre now seems powerless to halt the illegal annexation of their people’s land under the oversight of an occupying military force. The Israeli government allows the transfer of civilians into the West Bank to illegally occupy Palestinian land despite this being regarded by many legal experts as a war crime under Article 8 of the Rome Statute of the International Criminal Court. Is it really any surprise that teenagers throw stones in protest? Given our history in this part of the world, a responsible British Government should be considering now a more effective international challenge to stopping the Israeli government’s consequence-free ability to inflict illegal and inhumane treatment on the Palestinian children and their families. That is the least these forgotten children deserve. GAZA, (PIC)– The Popular Committee against the Siege has described the humanitarian conditions in the Gaza Strip as “catastrophic and tragic” under Israel’s tight blockade. In a press release on Friday, head of the committee Jamal al-Khudari stressed the need of the population in Gaza for international, Arab and Islamic efforts as well as national unity to overcome the impacts of the Israeli siege. Khudari underlined the Gaza population’s suffering from the closure of border crossing and different crises related to electricity, water and housing. According to him, 80 percent of Gaza industrial facilities have stopped its production activities and 70 percent of the homes destroyed in the 2014 war need to be rebuilt. He also pointed to the high poverty and unemployment rates among the population, appealing to Egypt to open the Rafah border crossing permanently. Occupied East Jerusalem – With a weary slump, Maisa Tamimi squeezed onto the living room sofa between her mother and husband. In recent months, Maisa’s life has changed dramatically. In early March, her eldest son, Foaud, was shot dead in occupied East Jerusalem after shooting and wounding two Israeli police officers. In the hours and days that followed, her husband was arrested and detained by Israeli police, while Maisa and her eldest children were interrogated. After six hours of questioning, they were driven by Israeli police to the Qalandia checkpoint and steered into the occupied West Bank at gunpoint, she said. After 11 days, Maisa’s husband, Kasef, was released without charge. No one in the family has been accused of any crime – but they can no longer return home, and are living in temporary accommodations, with some of Maisa’s family members at her mother’s apartment in Kufr Aqab and others at a relative’s house nearby. Kufr Aqab is located in the so-called seam zone, technically within the boundaries of East Jerusalem, but on the West Bank side of Israel’s separation wall. “The kids come to visit us here a lot, but it is more than difficult to be split up like this from two of my children. But it’s the only choice we have right now,” Maisa told Al Jazeera. There is no other state that acts in the same way. Israeli law is tailored to undermine Palestinians’ rights and existence. Before Fouad’s death, the Tamimi family lived in the East Jerusalem neighbourhood of Issawiya. Maisa holds the blue ID card that Israel gives to Palestinian residents of Jerusalem, while her husband, who was born in the West Bank, does not. Maisa and Kasef were years into a family unification process, which would have secured full residency status for the whole family. In the meantime, Kasef and the children were on temporary permits. 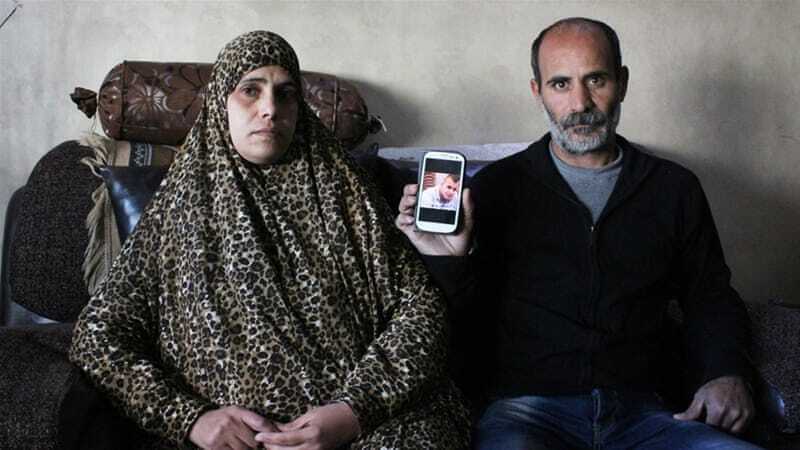 In the aftermath of Fouad’s death, when Israeli authorities saw that the family’s application for unification was pending, the process was immediately frozen, and the family was forcibly transferred to the West Bank. “We are looking for another place to live [in Kufr Aqab], but right now we can’t find a landlord who will rent to us. They know that we are the family of a martyr and they are afraid to rent to us, due to the possibility that Israel may come and demolish the house,” Maisa said. The speed of the family’s transfer, just two days after Fouad attacked the police officers in East Jerusalem, was unprecedented, according to the family’s lawyer, Mohammed Mahmoud. “I have never seen a case like this. Usually a family is given at least 24 to 48 hours to appeal a decision like this. But in this case, the family was thrown out immediately and were not given any time to appeal,” he told Al Jazeera, noting that this type of punishment is reserved exclusively for Palestinians and has never been used against Israelis, even when they have been found guilty of serious crimes. Israeli authorities did not immediately respond to Al Jazeera’s request for comment on the matter. In March, Yisrael Katz, an Israeli member of the Knesset, submitted a bill to allow the state to deport family members of Palestinian attackers to Gaza. The bill has not been voted on yet. Israel’s attorney general, Avichai Mandelblit, has previously suggested that such a policy would contravene international law. At the same time, human rights groups say that forced transfers of Palestinians from Jerusalem have been ongoing for almost 50 years. “We have three groups of people who are forced out: those who have their ID cards withdrawn, those whose family unification applications were rejected, and those who settled in Jerusalem before 1987, when it was easy to enter the city, but who were never given ID or residency cards,” said Ziyad Hammouri, director of the Jerusalem Center for Social and Economic Rights. Hammouri’s organisation has traced more than 14,900 cases where Israeli identity cards were revoked from Palestinians since the occupation of the West Bank and East Jerusalem began. The current policy of forced transfer amounts to a “demographic war” against Palestinians in Jerusalem, Hammouri added, referring to the Zionist policy of maintaining a Jewish population majority within Israel since 1947. For the family of Khaled Abu Arafeh, adjusting to their new life in the occupied West Bank has been a long and painful process. In 2006, after being appointed minister of Jerusalem affairs in the new Palestinian government, he was told by Israeli authorities to quit his new role or give up his Jerusalem residency. Abu Arafeh refused and four years later, having spent part of that time in prison and challenging the decision in the Israeli court system, Abu Arafeh was deported to the West Bank. In court, the Israeli prosecutor argued that Abu Arafeh and the lawmakers’ alleged association with the Hamas movement meant that they were not loyal to the state of Israel. He now lives with his family in a suburb of al-Bireh, close to Ramallah. Despite having lived away from Jerusalem for six years, Abu Arafeh still hopes that he will be able to return to his home city in the future. RAMALLAH, (PIC)– The Palestinian Legislative Council member, Khalida Jarrar, said that all Palestinian prisoners in the Israeli occupation prisons appeal to all Palestinians to prioritize their issue. The released MP stressed the need to end the internal division and the completion of the unity of the Palestinian people, saying: “This is the demand of all prisoners in Israeli jails.” Jarrar’s remarks came after her release from Israeli jails on Friday afternoon, at the Jubarah military checkpoint south of Tulkarem. She added: “I left the Hasharon prison with mixed feelings, feeling of joy and freedom but also pain because there are still many female prisoners left in Israeli prisons.” She continued: “There are 61 female captives, and there are 14 young girls captives who suffer woes behind bars.” Jarrar went on: “The Palestinian people will triumph in the end … and the prison will not remain closed on any prisoner regardless of fascist attempts to quell their call for freedom.” The Israeli occupation forces have arrested the member of the Palestinian parliament, Khalida Jarrar (deputy of the Popular Front), after storming her house in the city of el-Bireh at dawn on April 12th, 2015. The Israeli military court in Ofer accused MP Jarrar with belonging to a banned organization, encouraging attacks against Israel, and violating the travel ban order, so she was sentenced to 15 months. Jarrar, 53, had been elected as a deputy in the PLC, representing the Popular Front for the Liberation of Palestine (PFLP), in the second Palestinian legislative elections; in January, 2006 (in which Hamas a majority of 76 seats out of 132). Jarrar also worked as a secretary of the prisoners’ committee in Israeli jails. For its part, the Palestinian Prisoners Society (a non-governmental association), said that the Israeli occupation authorities still arrests six members of the Palestinian parliament; four of whom are affiliated with Hamas’s parliamentary bloc the Change and Reform, as well as one from the Fatah movement and one from the PFLP. 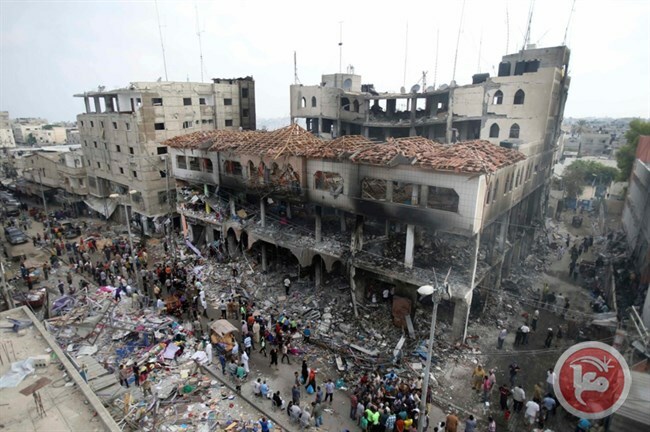 BETHLEHEM (Ma’an) — Israeli authorities have held discussions with representatives of the International Criminal Court (ICC), an ICC prosecutor announced on Thursday, agreeing to meet with the court after months of publicly refusing to cooperate with Palestinian attempts at charging Israel with war crimes during the 2014 Gaza war.ICC prosecutor Fatou Bensouda said that Israel “has agreed to engage with my office and we are exchanging information,” during a visit to the United Nations office in Geneva on Thursday, the Reuters news agency reported.Israeli representatives reportedly transferred information to the court regarding the 2014 war in the besieged Gaza Strip, according to the Times of Israel.However, the Israeli foreign minister was quoted by the Hebrew-language news site Wafa as saying, “there hasn’t been any change to Israel’s position. Israel does not accept that the ICC has the jurisdiction to discuss the issue. As has been said before, Israel is having dialogue with the office of the ICC prosecutor about the issue of lack of ICC jurisdiction.”Palestine formally joined the ICC in January to enable them to submit war crimes and crimes against humanity complaints against the Israeli government.On Jauary 16, Bensouda opened a preliminary investigation into possible war crimes committed against Palestinians during last year’s Gaza war, which left 2,200 Palestinians and 73 Israelis dead in the 50-day conflict.Bensouda has also opened preliminary investigations on crimes committed against Palestinians in the occupied West Bank, including East Jerusalem, since June 13, 2014.The Israeli government has consistently refused to cooperate or engage with the international court, with Israeli Major General Dan Efrony stating in February that “our agenda is not set by the ICC, we examine and investigate what should be investigated. We are a state that is willing and able to investigate and indict anyone that does something wrong.”However, despite opening over a dozen criminal investigations into incidents which transgressed during the war — including the shelling of a UN school on July 24 that killed at least 15 people — and taking testimony from a number of Palestinians in Gaza, no indictments have been filed.Israel has stated that the ICC does not have jurisdiction to carry out investigations in the occupied Palestinian territory as the country is not a signatory of the Rome Statute that allows for ICC jurisdiction.However, after Palestinian President Mahmoud Abbas signed the Rome Statute, he gave the ICC jurisdiction to investigate war crimes committed by both Israeli and Palestinian individuals within the Palestinian territory. It is no secret that in the midst of the ongoing turmoil in the Middle East, Tunisia has emerged as the brightest spot. It is also no secret that Tunisia’s success has been made possible in part by the moderate stance of its main Islamist party, Ennahda, which on May 21 at its party congress announced that it was officially abandoning political Islam. The longtime leader of the party, Rachid Ghannouchi, who was re-elected at the event, vowed to “keep religion far from political struggles” and announced that Ennahda would abandon all its religious activities, including preaching in mosques. Naturally, this news reminded some of the founding of Turkey’s Justice and Development Party (AKP) 15 years ago. At that time, the AKP, which came from an “Islamist” political tradition, had also declared a major change in perspective. Similar to Ennahda’s new self-identification as “Muslim democrats,” the AKP’s founders called themselves “conservative democrats.” The term “conservative” in Turkey is often another way of saying “practicing Muslim.” Moreover, Ghannouchi had in the past spoken about the “Turkish experience” and pointed to it as a positive frame of reference. Israel eventually demanded a vote on the Gaza resolution late on the final day of the UN talks, surprising many – but the sudden demand appears to have been tactically designed to to permanently block a vote on the resolution. Israeli soldiers invaded, on Friday at dawn, the northern West Bank city of Nablus, and clashed with many local youths, wounding two Palestinians with live fire, while one of them suffered a life-threatening head injury. One Palestinian was kidnapped In Qalqilia. The invasion led to clashes between the soldiers, who fired many live rounds and rubber-coated steel bullets, and local youngsters, who hurled stones and empty bottles on the invading vehicles. Medical sources said Jamal Mohammad Dweikat, 20, from Balata, was shot with a live round in the head, leading to a very serious injury, while another young man suffered a moderate injury after the soldiers shot him in the leg. Both Palestinians were rushed to a hospital in Nablus, while the soldiers also invaded several neighborhoods. Under the 1993 Oslo Accords, the site was to remain under Israeli control. However, the Israeli army evacuated the premises in October 2000 shortly after the start of the Second Intifada. 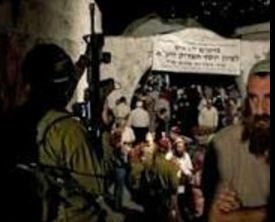 Following security cooperation with the Palestinian Authority, the Israeli army allows Jewish worshipers to make monthly nocturnal pilgrimages to the site; the Palestinians are not allowed access. Palestinians believe that Joseph’s Tomb is the funerary monument to Sheikh Yousef Dweikat, a local religious figure. Others believe that the tomb belongs to the Biblical patriarch Joseph. The area is sacred to Jews, Samaritans, Christians and Muslims alike. Joseph’s Tomb is revered by Jews, Muslims, Christians and Samaritans. In related news, the soldiers invaded Azzoun town, east of the northern West Bank city of Qalqilia, and kidnapped one Palestinian. The soldiers also fired several flares, gas bombs and concussion grenades during the invasion. RAMALLAH, (PIC)– The Palestine center for studies said on Saturday that the Israeli occupation authorities (IOA) had renewed the administrative detention of two leaders of the Popular Front for the Liberation of Palestine (PFLP) for the third consecutive time. The PCS said in a press release that the IOA renewed the detention without trial or charge of Jamal Burham, 56, and Shaher Ra’ee, 47, from Tulkarem and Qalqiliya respectively for sixth months. It said that both PFLP leaders have been held in the Negev desert prison since their detention a year ago, adding that they were arrested for affiliation with the PFLP. Head of the Syrian interim government Jawad Abu Hatab called on the international community to protect health and educational facilities as well as all other civilian infrastructure in liberated areas from the barbaric bombardment by the Assad regime and Russian forces. Abu Hatab stressed that this move is vital to enable the interim government to provide services to the civilian population in liberated areas. In a two-day meeting with the Syrian Coalition’s political committee, Abu Hatab called on humanitarian organizations and neighboring countries to deal directly with the Syrian interim government institutions. He called for facilitating imports of raw materials, petroleum, agricultural products and livestock to liberated areas. He also called for facilitating exports of agricultural products in order to revamp the economy in liberated areas. Abu Hatab pointed out that this will help pave the way for refugees and displaced persons to return to their homes. Abu Hatab gave an overview of the latest developments regarding the formation of the interim government and meetings Abu Hatab held with concerned bodies in liberated areas. The meeting with the political committee also discussed the interim government’s action plan. Members of the Coalition’s political committee met with the Coalition members who are part of the opposition’s High Negotiations Committee (HNC) to discuss the latest developments concerning the political process and the Geneva talks. The meeting also discussed preparations for the launch of the meetings of “technical delegations” in the coming days in Geneva. The meeting also reviewed developments with regards to holding consultations between the HNC on one side and the “Cairo” and “Moscow” opposition platforms and civil society organizations on the other.